The application font and font size can now be changed under Options->UI. User shares can now be saved to XML files. Message multiple users option under Users->User List allows messaging all user list users, a specific group, or downloading users. The search history can now be cleared from Options->General. User share action buttons should now show up even if the folder list isn't selected. Extra spaces are no longer swallowed in private and room chat. User info should now show properly on Soulseek NS clients. Support for popular image types in user info (which stopped working with the new Qt library) has now been restored via extra DLLs in the program install. Additionally, textual user info should now show even if the image can't be loaded successfully. Bewildered cat icon for users without an identifiable country flag. Permalink Submitted by psynaturecybine on Fri, 03/01/2013 - 06:12. Lot of great changes here, thanks! (not listed, but thanks for letting us get rid of downloading and complete folders finally!) i still experience very nasty bug, that is that when i select "download folder(s)" from search results, only files that are shown in result will donwload, and rest from this folder won't. have to browse users folder and again select "download folder(s)" to get all of them. Permalink Submitted by Nir on Fri, 03/01/2013 - 11:55. Ah, thanks for reminding me about the downloading/complete setting. And thanks for the kind word! The download files in folder is not a bug though, there's an entry for it in the FAQ explaining why this is happening. Permalink Submitted by thescarletfire on Fri, 03/01/2013 - 09:16. Anything special we need to know on how to use the XML feature? How would we go about using this XML w/ the client? I've successfully downloaded other users' shares to XML, but since we can't browse our own shares in QT (open ports or not), I'm not sure how to use this XML feature. Can you walk us through its primary function? How/Do we re-import that XML somewhere in Soulseek? I'm confused, sorry. Permalink Submitted by Nir on Fri, 03/01/2013 - 17:22. Thanks scarlet! I was confused by it too if you look at the corresponding feature request. The rationale I was given is that some people want an offline copy of I guess their favorite users for general browsing purposes, and a bunch of people voted up the request so I figured what the hell, and XML is very easy to view in a browser or other program. I do agree that it's kind of an awkward, one-way feature though. Permalink Submitted by microwave on Fri, 03/08/2013 - 14:41. I do like the XML export. Not sure if I'll use it, but it's nice to have. I suggest adding date-time attributes in the document element to indicate when the data was fetched and exported; something like user name="..." fetch-date="..." export-date="...". If you want the date-time to be both human- and machine-readable, then ideally it should be in an ISO 8601 format. If you don't care, then milliseconds-since-epoch or whatever is fine. What would be nice is if, on the browse screen, there was a Load from File button. Then I could load the XML back in to browse someone's shares and get some things queued on my end without both of us having to be online. Permalink Submitted by thescarletfire on Fri, 03/01/2013 - 17:35. Ah gotcha, I was wondering if it was a one-way thing - still, sweet stuff man! You're a sick programmer. I wish I knew C++ as much as you do lol I'm more into networking and CEH. Permalink Submitted by Nir on Sun, 03/03/2013 - 20:39. Permalink Submitted by famterhorst on Sun, 03/03/2013 - 16:51. Permalink Submitted by NeoGuy on Wed, 03/06/2013 - 15:34. I just want to thank you for keeping this project alive... I have loved soul seek since I started DJing, and it's the best way to get my music out there and to find new music. Thank you! Permalink Submitted by Nir on Thu, 03/07/2013 - 01:03. Thank you Neo! It's always great hearing from professionals like yourself who are able to use Soulseek to create and become inspired. Permalink Submitted by psynaturecybine on Thu, 03/07/2013 - 14:14. Permalink Submitted by microwave on Fri, 03/08/2013 - 14:26. I'm seeing similar freezes. It's only every once in a while. For me, everything is unresponsive except the window minimize button. Win7/64bit greys out the application window, and the mouse cursor is the "busy" circle icon. But eventually the GUI does come back to life, as if nothing happened. Memory usage was moderately high but not excessive. The handle count was low, then shot way up for a while when it came back to life, then went back down. I wonder sometimes if it has to do with people on slow connections browsing my files or doing wacky searches that return huge result sets. Just a shot in the dark. Permalink Submitted by psynaturecybine on Fri, 03/08/2013 - 14:29.
i guess soulseekqt can't be trusted yet http://i.imgbox.com/acwFCNRX.png - this happend 2nd time today. had to delete track from disk and reselect it to download again. Permalink Submitted by Nir on Sat, 03/09/2013 - 14:16. Someone else reported this on the forum, my top priority right now is to fix this. Did it only start happening with the latest build? Can you try the previous build and see if it's still happening? edit: Are you using the 'Don't put downloads in Downloading and Complete folders' setting? Permalink Submitted by psynaturecybine on Tue, 03/12/2013 - 04:33.
" Did it only start happening with the latest build? not 100% sure, but i think so. "Are you using the 'Don't put downloads in Downloading and Complete folders' setting?" yes, i'm using it. will check previous builds and see if it happens there. Permalink Submitted by Nir on Tue, 03/12/2013 - 17:22. Try the build I posted to this thread, I believe it fixes the problem. Permalink Submitted by psynaturecybine on Sat, 03/16/2013 - 12:12. Permalink Submitted by thescarletfire on Fri, 03/08/2013 - 15:51. I assume when you write Win5.1 you mean WinXP? If so, you really should upgrade to Windows 7 - there's so many reasons why you ought to. And trust me, I'm no Windows fan, but Win7 is by far the most stable OS MS has offered us. SoulseekQT is far superior to the NS, from my experiences though I haven't touched XP in forever. Permalink Submitted by trgarner on Sat, 03/09/2013 - 21:49. Thanks, I was just saying to myself I want to increase my font size but how? I looked and looked and just couldn't find a font size option... so I said better check for an update and GUESS WHAT? here it is!!! thanks doing a great job! Permalink Submitted by s1nner on Sun, 03/10/2013 - 11:34. Permalink Submitted by Nir on Sun, 03/10/2013 - 14:35. Do you remember doing anything specific when that happened? Permalink Submitted by s1nner on Sun, 03/10/2013 - 15:13.
no, it just started when i get updated for a new version. but after i've installed previous, it shows the same :[ Slsk NS works fine... Hm, maybe update of Adobe Flash player could cause this error, but how? Should i try to install .NET Framework maybe? 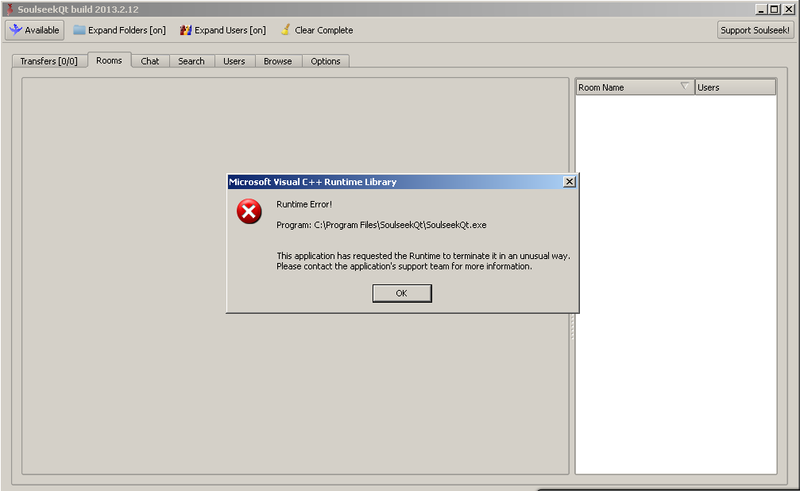 Or complete full uninstall slskqt first..
Permalink Submitted by mcornwall on Fri, 03/15/2013 - 14:24. Permalink Submitted by Slot on Sat, 03/16/2013 - 01:56. Permalink Submitted by bulger on Mon, 03/18/2013 - 08:17. I am getting the feeling, though that after operating some time (~1 day) it gets less responsive to users. It will be sitting there with 0 uploads, and if I end Slsk and restart it, suddenly there will be 3 or 4 active uploads. Like it needs to be kicked to restart stalled uploads. Win XP, 16K files. I also see the occasional 30s or so pause, but this is on an old laptop with 1MB RAM and the CPU throttled back some, so that could just be Windows. Permalink Submitted by thescarletfire on Wed, 03/20/2013 - 14:13. Windows really needs more than 1GB RAM for just the basic OS tasks, not counting on top of that SoulseekQt does hunger for memory after long periods of time - so, if possible I'd certainly upgrade your RAM. You'll notice a substantial difference. Permalink Submitted by bulger on Fri, 04/05/2013 - 22:16. Yabbut.. I don't run anything else to speak of on this computer, and a typical (ClearInfo) reading is that it's using 6% CPU, 658M RAM, and 640M swap. Everything else works (Chrome, etc.). So I don't think I'm overstressing XP. Tonight when I checked the machine, it had one DL. I closed slsk and restarted it, and there were 5 DLs. Win uptime about 5 days. I don't know for sure which side the problem is on, whether the DLers or me. But it does exist. Permalink Submitted by bulger on Sat, 04/06/2013 - 18:59. Yeah, I should add more (this particular computer will go to 2GB). But it isn't doing anything else, and usually shows about 615M RAM and the same amount of swap in use, so I don't think it's memory. I'm sure as to the effect (shut slsk down, start it back up, and ULs go from 1 to 4-5). But don't know cause, it's been a year or so since I used slsk. This slskqt version, or something with slsk clients in general, or the way the network works? Anybody else see that happening? The momentary hangs, I think I used to see that with slsknt. Figured it was probably somebody DLing a file list. Permalink Submitted by mbuto on Wed, 03/20/2013 - 00:56. Great! Now I can see my user info along with the picture in it! Permalink Submitted by Nir on Sat, 03/23/2013 - 18:04. Permalink Submitted by musichemyst on Tue, 03/26/2013 - 13:10. Yet another great batch of additions and improvements to the client -- thanks, Nir! In particular... Thanks for control of font face/size; that's very cool for all the layout/interface tweaking nerds (like myself) that prefer system-wide use of small scale condensed-style fonts to maximize the size of and the amount data visible in any given window/tab/etc. Also thanks for adding rate limiting to downloads; this was the final item I was waiting for to solve the bandwidth tug-of-war (i.e. bottlenecking and page load timeouts) that previously occurred during simultaneous running of Soulseek, a torrent client and a web browser. Permalink Submitted by Nir on Thu, 03/28/2013 - 13:38. Thank you! I'm surprised it's taken someone that long to mention font configuration :) I was very excited about that one myself. Permalink Submitted by pqatsi on Sun, 03/31/2013 - 04:44. And a question: Do you think in release SLSK source code sometime? Permalink Submitted by psynaturecybine on Wed, 04/10/2013 - 10:04.
would be nice to see a full changelog for todays version... i accidentally closed update window, but does it have to mean that i won't see new changes? Permalink Submitted by Nir on Wed, 04/10/2013 - 11:02. Permalink Submitted by alex_sb on Mon, 09/09/2013 - 11:54.
hello, i face a serious problem in installation of the app. i have mac osx version 10.5.8. and i downloaded the correct file and after intallation when i try to open the app , my pc still writes that the application of soulseekqt quit unexpectedly. please give me some help at your earliest convinience. kind regards and greetings from greece..
Permalink Submitted by Nir on Wed, 09/11/2013 - 11:55. As stated on the download page, SoulseekQt requires Snow Leopard or newer.